I love the stacked VHS box design! Each quarter has its own theme. The Spring theme was Nicktoons Rewind! It features Rocko’s Modern Life, Ren & Stimpy, Rugrats, Hey! Arnold, AAAHH!!! Real Monsters, CatDog, Angry Beavers, The Wild Thornberrys, and Rocket Power. I’m a massive Rocko fan, so when I opened the box to see this beauty, it was my first or many gasp moments during the unboxing of this quarter’s Nick Box. It’s an amazing replica of Rocko’s outfit – it also has some really awesome quality! It’s a 60/40 Cotton/Polyester blend and is a nice, thick, material. Pop it on and rock the style of your favorite mid-90’s wallaby! To complete the look – you’ll get a pair of Rocko socks that mimic his legs and shoes! These have the thickness of a dress sock – they’re probably best for cosplay like it’s mentioned on the card. Be still my beating heart. This was the biggest ‘OMG’ moment of the box for me – I couldn’t have picked a better vinyl figure! Filbert is pulled from the episode ‘The Lounge Singer’ where he fulfills his dream of becoming a lounge singer. The vinyl stands about 6 inches tall, including the base – I love it! If we’re getting Rocko and Filbert – you can’t forget Heffer! The blanket measures 56×38 inches and is a super soft polyester material. On top of being soft, what I like most about The Nick Box (and Pusheen for that matter) is that the products are well made! There are two Ren and Stimpy items this quarter – the first lets you carry a sandwich, or powdered toast, in style! You’ll get 3 enamel pins featuring Ren, Stimpy, and Log – and all kids love log! I love the classy Log look! 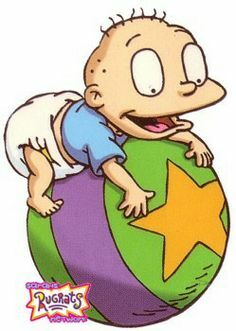 The only Rugrats item is a stress ball that is made to look like Tommy’s play ball. They did an awesome job, too! You’ll get a 7×6 inch pillow featuring Helga’s locket with Arnold’s picture! Again – awesome job with the recreation! It’s thick, too – almost 3 inches thick. Ickis, Oblina, and Krumm get their own vinyl decal! It’s large, too – about 10×6.5 inches at it’s longest points. They even suggest a spot to use it! The last item(s) in the box is a set of 4 stickers featuring CatDog, Angry Beavers, The Wild Thornberrys, and Rocket Power. Not only are the graphics great – but the stickers are thick and high-quality! Verdict: I am in fanboy heaven with the second Nicktoon box from The Nick Box! They could do unlimited Nicktoons boxes and I don’t think I’d ever be not excited to open it up – they’ve really knocked it out of the park again. The box is pricey – but you’re also getting high-quality items, and 9 of them to boot. I’m excited about the next theme because this was my favorite Nick Box yet! What do you think of the Spring 2017 ‘Nicktoons Rewind’ box from The Nick Box? I’m all about those stickers! I love how happy you look in your Rocko shirt! I literally got my box yesterday and was SO EXCITED! Filbert is in my office, Ren and Stimpy pins are on a vest I wear frequently at work (Log broke 🙁 ) and Heffer blanket is so soft and i slept with it last night! I love the Nick Box! So fun to read review. Great box! They really put in a lot of effort.